Samhain, (pronounced sow-in) is a Wiccan holiday. It is one of their eight major holidays, or Sabbats. Although there are many different types of Wicca, all Wiccans share some common beliefs. They love and respect nature, and try to live in harmony with the earth. One of their main beliefs is "Harm None." This includes animals, humans, and nature. Samhain is observed from sunset on October 31st to sunset on November 1st. It is the celebration that is the origin of Halloween. Samhain was first observed by Celtic Pagans. Samhain marked the Celtic New Year, the end of summer, and the end of the harvest season. It also signaled the beginning of winter, which they associated with death. On this day, the Celts believed the veil between the living and the dead was especially thin. This allowed spirits of the dead to visit the living. 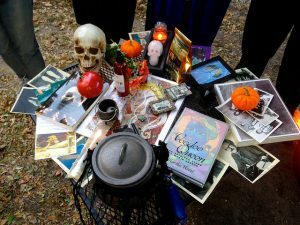 Photo of an altar set up for Samhain. Photo taken by Flickr user Bart Everson. The meaning behind Samhain remains the same today. There are many rituals associated with Samhain today. These include dancing, feasting, taking nature walks, and building altars to honor their ancestors. There are many parts to the altars Wiccans build. To symbolize the end of the harvest, they include apples, pumpkins, or other fall crops. To represent the spirits of the dead, skulls or skeletons are placed on the altar. Photos of deceased family members are also added. Some Wiccans bake loaves of special Samhain bread for the altar, to feed visiting spirits. Some Wiccan families cast a circle and think of their deceased loved ones. As a part of the ritual, they will share stories of their ancestors. Some families choose to visit the cemetery to honor their family members, instead. Día de los Muertos, or “Day of the Dead” as it translates in English, began in central and southern Mexico thousands of years ago. At that time, mourning the dead was seen as disrespectful. Instead of grieving, it was more important to keep the memory of those who have passed alive. Those who celebrate the holiday believe that at midnight on October 31, the souls of deceased children come down from heaven and reunite with their families on November 1. In the Roman Catholic tradition, November 1st is also All Saints Day. 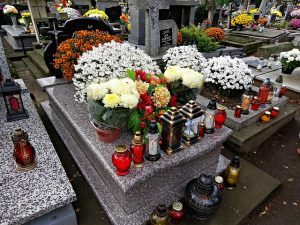 They believe the souls of deceased adults come to visit on November 2, which is also known as All Souls Day in the Catholic religion. The festivities surrounding Dia de los Muertos are filled with calaveras (skulls) and calacas (skeletons). Celebrators wear colorful makeup and costumes, holdparades and parties, sing and dance, and make offerings to lost loved ones. 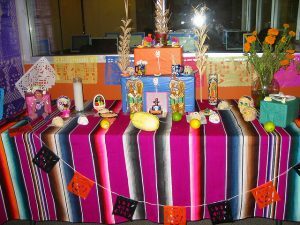 People also create altars in honor of loved ones who have passed. They are decorated with pictures, flowers, candles, the deceased loved one's favorite food, and pan de muerto (bread of the dead). Despite the painted faces, costumes, skulls and skeletons, it is important to note that this holiday is not a Mexican version of Halloween. Dia de los Muertos is not intended to be a spooky holiday like Halloween. While Halloween is dark and scary, the Day of the Dead is a bright and colorful celebration of life. Both holidays share the theme of death, but the point of Dia de los Muertos is to celebrate the memory of those who have died. On the first of November, Western Christian churchgoers will celebrate All Saints Day. This day is also known as All Hallows' Day, Hallowmas, or the Feast of All Saints. Eastern Christians celebrate this holiday on the first Sunday after Pentecost. This holiday is also a holy day of obligation in Catholicism. This means Catholics are required to attend mass that day. As the name suggests, the holiday honors all the Saints of the church. On this day, celebrators gather in prayer and worship. The exact origins of All Saints day is uncertain. However, the November 1 celebration of the holiday can be traced to the 8th century when Pope Gregory IIIreigned (731–741). He built a special chapel in Rome dedicated to the memory of all the Saints on November 1. Then, Pope Gregory IV and Emperor Louis the Pious extended the November 1 feast of All Saints to the Holy Roman Empire in the 9th century. From there, it spread throughout Europe. The Christian festival of All Saints Day comes from a belief that there is a spiritual connection between those in Heaven and on Earth. In Catholic tradition, the holiday honors all those who have passed on to the Kingdom of Heaven. In Methodist tradition, All Saints Day is about giving God earnest gratitude for the lives and deaths of his saints, and remembering all of them. Additionally, select individuals from Christian history are celebrated. Such figures are Peter the Apostle and Charles Wesley. Those who have personally guided one to faith in Jesus, such as one's relative or friend are also celebrated. The holiday has slightly different meanings to different worshipers. However, they are united in that they are renewing and reaffirming their faith by celebrating All Saints Day.